Guernsey's Chris Simpson says he is confident of getting past the first round of the World Championships for only the second time in his career. 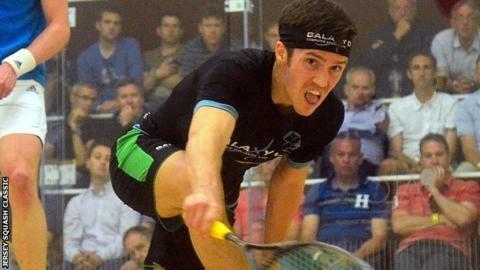 The world number 23 faces South African Stephen Coppinger, ranked eight places higher, at Bellevue in the Unites States later this month. Simpson has entered every year since 2009, but has only overcome his first hurdle once, in 2012. "It's a tough draw, but definitely one that's winnable," the 28-year-old said. Simpson goes into the event having won the biggest tournament of his career at last month's St George's Hill Open. "I've managed to get a couple of wins against players that I've never beaten before who are ranked above me in the rankings, so I'm feeling confident," he told BBC Radio Guernsey. "It's one of the tougher first rounds, but my main thing is to try and stay away from the top four players, if I stay away from them then I can beat any of the others on my day. "Steve is a very tough player, but it's a winnable match for me and it's one I'm looking forward to a lot."